The Silver Cross Princess Dolls Pram is strictly limited to 800 worldwide, making it extra special! An exquisitely handmade dolls prams for the special little girl in your life. Every pram is made to the same exacting standards employed for generations. These special edition prams come with a selection of extras and are strictly limited in production, making them extra special for your little princess. 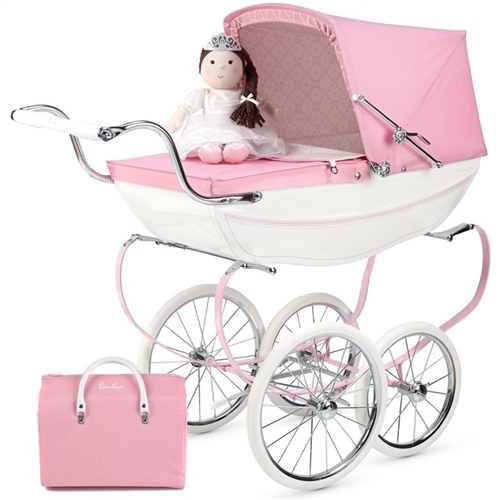 The Princess is different to Silver Cross’ other dolls prams because the high polish metal bodywork is finished in brilliant white metallic paint with hand painted fine line detail in pink. As well as the sparkling paintwork, the hand stitched, fully lined hood and apron set comes supplied in a brand new shimmering pink fabric, which makes the Princess pram sparkle and shine brightly!